Honda Malaysia has introduced the new limited edition HR-V Mugen, which features a number of visual enhancements over the standard car. The HR-V Mugen is priced at RM118,800 on-the-road without insurance, and only 1,020 units will be made available. The car comes with a total of nine additional items, including a front under spoiler, rear under spoiler, new grille, side skirts, tailgate spoiler, decals and Mugen emblems for the exterior. Moving inside, you’ll find a Mugen emblem near the gear lever as well as dedicated floor mats that feature ‘HR-V Limited Edition’ lettering on them. Aside from the floor mats, all parts are official Honda Access ones. All these items account for the RM1,370 premium the HR-V Mugen commands over the 1.8 V which it is based on. The rest of the car is largely unchanged, with the same 1.8 litre i-VTEC SOHC petrol engine (142 PS/172 Nm) mated to an Earth Dreams CVT. 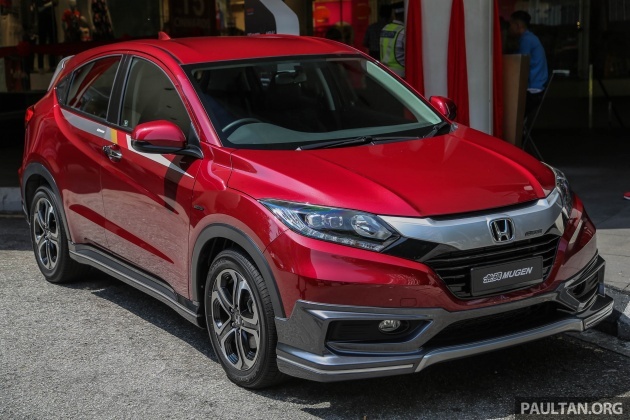 Buyers will get to choose from two exterior colours for the HR-V Mugen – Dark Ruby Red Pearl and White Orchid Pearl, with the latter costing an additional RM300 on top of the retail price. The kit is only available with the car, and cannot be purchased as an add-on by existing HR-V owners. Singapore sells CBU HRV Hybrid. It is so cheap in Singapore. It only cost SGD65k. Don’t calculate into ringgit. SGD65K is not same RM65K. Try convert that currency into USD. He meant, one on one basis.. Your salary as technician will be RM3k or SGD3k..Same, dont convert..but the car price there is only 65k instead of RM120k..
Spore GOVT always hike SGD to makes ALL IMPORTS cheapest as possible.. But pump petrol, …hmmm.. Fix and focus on clients COMPROMISED QUALITY issues first, rather than adding interior and exterior designs.. Why?? Refer to your 12/8/2016 report on HR-V. Took nearly 2 years. Last push to rid all the old stock HRV. But please do a more convincing job la. This is bloody ugly HONDA Malaysia. Mugen official parts. ini sarahan Mugen. Those who bought the V specs earlier must be feeling damn piss off when they were told – cannot be purchased as an add-on by existing HR-V owners. Mugen parts r available from Honda Access but definitely not at RM1,370. I called and clarify that there wont be any discount/ rebate for the Mugen model. Therefore the different should be RM 3,370 from the original V spec. Special edition b4 facelift comes with more kit, better safety, at same price. They are going to do clearance for the facelift to come. Clearing stocks due to HRV hybrid coming soon? Instead of all this goreng, why don’t Honda Malaysia bring in the HRV Hybrid like how Singapore does? All cosmetic upgrades only. Interior built quality is still horrendous. Not surprised that later one day, all the Mugen exterior parts will be stolen by thieves to resell to kedai Ah Beng at Sunway, etc. Maybe next coming iteration is HRV Type-R ? Wow!!! Official Mugen from Honda! Clearly looks like clearing old stock with cosmetic upgrades for upcoming facelift premium HRV model. Standard practice in order to get rid of stock or soon to be obsolete item. Congratulation honda on d variant. Very clever. Go Kedai Brader can get same kit cheaper. But, there will always be a buyer for these kind of gimmicks. Bodykits are cosmetics. Wont even help with aero performance. I guess the bodykits is just syoik syoik looking at only…..
OEM mugen parts and as such a small premium. Value for money if really buying it now. Pity the alloys the same. Should just give buyers an option to add on for different design or a size up to 18 inch mugen alloy wheels. Like they did to the mugen edition civic FD quite some time ago . Wow I can’t believe after a long time Honda Malaysia finally decided to copy Toyota Malaysia ah beng fantasy syok sendiri copy paste plasticky add-ons. This so-called Mugen HRV reminds me of Vios TRD – the brilliant idea by Toyota sales team. the car better off without the bodykit. wa…just add the kit, dont even bother colour it to match car body colour?? only left 1020 unsold units? quite tired of seeing this on the road. needs a change.